Suppose you want to incorporate tweeting into an app you're building on your Raspberry Pi. 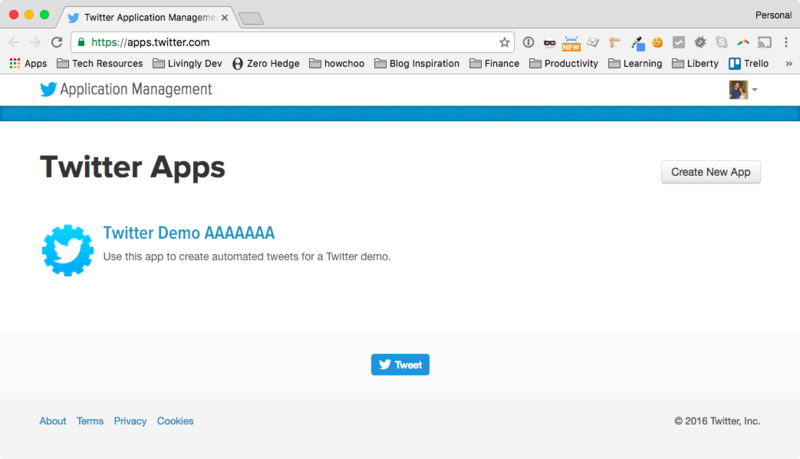 This guide will walk you through the process of creating a twitter app, generating access tokens, and sending a tweet. To learn the process, we're going to create a simple app on our Raspberry Pi that tweets the output of the uptime command. This might be a contrived example, but it will easily demonstrate what is required to tweet from the pi. We've created a repository to be used for the duration of this guide. We will refer to code within so it will be helpful to clone the repository. For your own application, you can use this code as a starting point or just copy pieces you want to use. Then cd into the repo. Optional You may want to install the packages in a virtual environment. In order to Tweet from your Raspberry Pi, you'll need to create a new Twitter app. First log into your Twitter account and go to https://apps.twitter.com, then click on "Create New App". Follow the instructions, then submit. This app will allow us to Tweet on behalf of our Twitter user. At the time I'm writing this, a valid URL is not required. We won't need a URL so you can just use a placeholder. Click on "Permissions" and make sure that "Read, Write, and Access direct messages" is checked. Maybe we can set up a motion sensor and camera and tweet pictures of our cat. Or maybe we can set up a thermometer and tweet some predefined statuses that are appropriate for the weather. Or if we just want everyone to know the load average of our pi, we can leave the repo as is and tweet our uptime command. A tabletop arcade cabinet full of Pi!